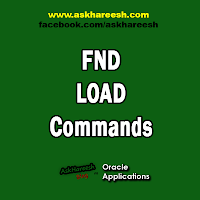 FND is short for “Foundation” which was the name Oracle initially wanted to use for the Application Object Library- the application with common components shared between all the other applications in the Oracle E-Business Suite. FNDLOAD apps/apps O Y DOWNLOAD $FND_TOP/patch/115/import/afscprof.lct XXPRNAME.ldt PROFILE PROFILE_NAME="XXPRNAME" APPLICATION_SHORT_NAME="PN"
2. FNDLOAD apps/apps 0 Y UPLOAD_PARTIAL $FND_TOP/patch/115/import/afscprof.lct XXPRNAME.ldt PROFILE PROFILE_NAME=" XXPRNAME" APPLICATION_SHORT_NAME="PN"
FNDLOAD apps/apps O Y DOWNLOAD $FND_TOP/patch/115/import/afsload.lct XXFRMNAME.ldt FORM APPLICATION_SHORT_NAME="PN" FORM_NAME="XXFRMNAME"
FNDLOAD apps/apps O Y DOWNLOAD $FND_TOP/patch/115/import/afsload.lct XXFUNNAME.ldt FUNCTION FUNC_APP_SHORT_NAME="PN" FUNCTION_NAME="XXFUNNAME"
FNDLOAD apps/apps O Y DOWNLOAD $FND_TOP/patch/115/import/afsload.lct XXMNNAME.ldt MENU MENU_NAME="XXMNNAME"
FNDLOAD apps/apps O Y DOWNLOAD $FND_TOP/patch/115/import/afscursp.lct XXRESNAME.ldt FND_RESPONSIBILITY RESP_KEY="XXRESNAME"
2. FNDLOAD apps/apps 0 Y UPLOAD_PARTIAL $FND_TOP/patch/115/import/afscursp.lct XXRESNAME.ldt FND_RESPONSIBILITY RESP_KEY="XXRESNAME" APPLICATION_SHORT_NAME="PN"
FNDLOAD apps/apps O Y DOWNLOAD $FND_TOP/patch/115/import/afcpreqg.lct XXRQGNAME.ldt REQUEST_GROUP REQUEST_GROUP_NAME="XXRQGNAME" APPLICATION_SHORT_NAME="PN"
2. FNDLOAD apps/apps 0 Y UPLOAD_PARTIAL $FND_TOP/patch/115/import/afcpreqg.lct XXRQGNAME.ldt REQUEST_GROUP REQUEST_GROUP_NAME="XXRQGNAME" APPLICATION_SHORT_NAME="PN"